Here is a selection of planned sessions during the animago AWARD & CONFERENCE 2017. All lectures will be in English language. We are updating this list on a regular basis. Phil Amelung (Concept Artist at Trixter) will show his approach to creature ideation and concept design using ZBrush. MPC will give an insight into the production of the latest and greatest Ads from 2017 featuring the Cannes Gold Winner in VFX and Animation – The Samsung Ostrich Campaign as well as the VFX Work on the epic Heineken Trailblazers Project. He will deep dive into showcasing workflow examples of various types of state-of-the-art broadcast graphics applications. Set construction and storytelling of historical features are enhanced by using visual effects as a tool to create places from the past. "Guardians of the Galaxy Vol. 2" saw Rocket return home to Framestore, where the team created the look and led the animation on the wise-cracking Raccoon and that of his new sidekick: the adorable, scene-stealing Baby Groot. Pixar's Director of Photography Erik Smitt will discuss his approach to cinematography and lighting through a variety of materials. "The Dark Tower" is widely considered Stephen King's magnum opus. Senior Lighter Matthias Menz will share his journey through the art of digital lighting at Weta Digital. In this presentation, this year’s VFX academy award winners MPC will reveal their stunning water work on Disney's "Pirates of the Caribbean: Dead Men Tell No Tales". Starting with his own home GPU workstation, built for personal projects, Andre Matos went through a rapid evolution of both workflow and work-docus. Switching to GPU rendering and starting using CUDA marked a turning point in his career and a complete project pipeline makeover for him – to the point that today he colloquially refers to himself as CUDA-boy. Cities or digital film sets are beautiful and an essential part of movie blockbusters like "Guardian of the Galaxy Vol. 2", "Independence Day: Resurgence", "Big Hero 6", "Zoomania", etc. Mike Hermes shows how to prepare and present yourself and your work in order to get hired and make a living as a freelance 3D artist. Filip Lange and Wolfgang Emmrich from nhb studios talking about a full blown VFX production for the upcoming mmorpg game from Youzu starring Wonder Woman Gal Gadot. The most creative ideas are often a result of coincidence – which was also the case with the animated short "Shine", which was born during the team’s visit in a bier garden. One of the reasons why animated films are so fascinating is that they seem to make the impossible possible. Looking back on last years highlight projects at Aixsponza we try to find a formula for combining mathematics with aesthetics. Learn how Scanline VFX built a pipeline to generate massive urban environments. An in-depth look at the process of creating next level VR experiences. 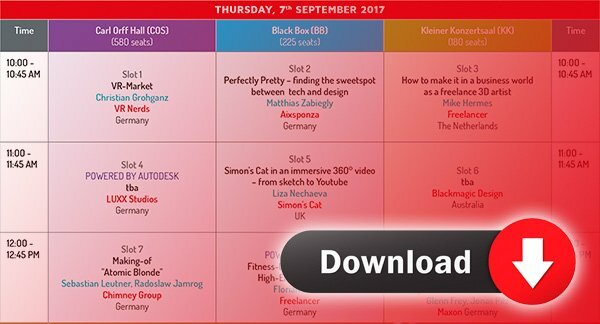 This lecture will explore how Simon’s Cat make its 360 videos, from start to finish, and will show you the techniques you need to make your own 360 video. Join Creative Director Robert Hranitzky in this exciting presentation as he will be breaking down how the TOCA ME 2017 Opening Titles were created. Virtual Reality / Augmented Reality: Hype, disillusionment or digital revolution? Virtual Reality – Hype, niche product or the leading digital medium of the future? Augmented Reality – Hope carrier, Digital revolution or flop? And why is it the fastest to learn and easiest to use professional 3D software? For the latest hit feature film in the DC Cinematic Universe, "Wonder Woman", Pixomondo created extensive set extensions and massive destruction scenes to take the audience back to the World War 1 period.